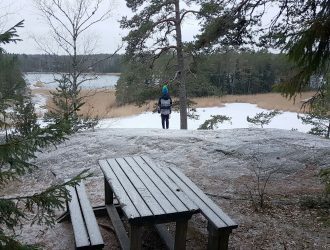 In one of the most beautiful towns in Finland, Porvoo, you can also find the Ekudden (oak cape or peninsula) nature trail that showcases many of the various vistas Finland has to offer. 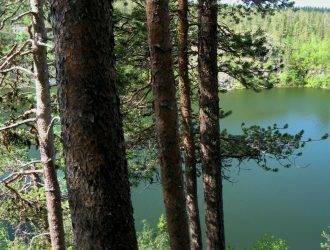 The nature trail is located 3km (1,9mi) from the centre of Porvoo, and it is about 1,5km long. You would think that this is a short trail but it has so many wonderful distractions on its route that you should definitely give yourself 1-2h to go around it. Combining Ekudden with a visit to old Porvoo with wonderful wooden buildings and historical landmarks makes for a great daytrip! The trail starts at a sports field guarded by a bear carved out of wood. The start of the trail is not very well marked so it took my mother and I a few minutes to figure out where we needed to go. The trail starts with a few tiny wood bridges that take you over two streams onto a small footpath between two fields. You immediately see a signpost that tells visitors about the surrounding area, the landscape, and the greenery. 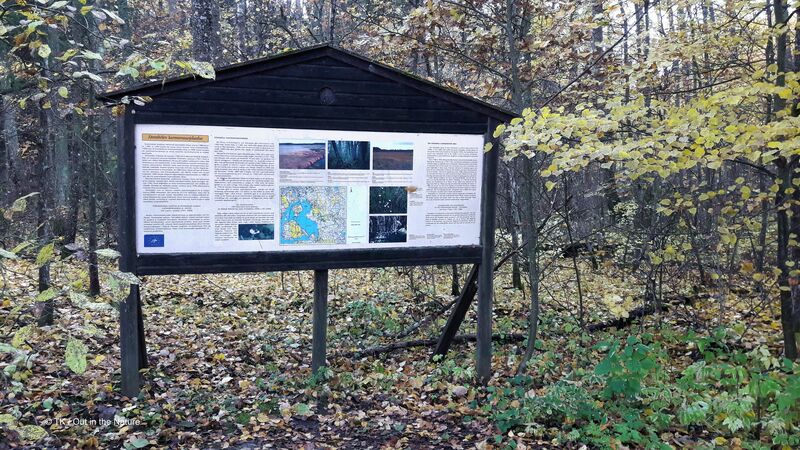 Once you reach the edge of the forest, a larger sign tells you about the nature reserve of Ekudden and it’s importance in the larger landscape of Finland. We started walking right from the large signpost because it looked the most inviting to us: large duckboards, lush tree foliage, and birds singing in the forest. 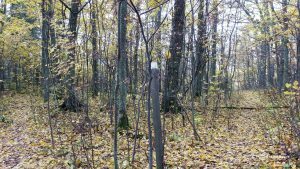 Quite soon there was a confusing plain wooden post with a white dot on the end. The trail forked from there: one continuing to the left, one going towards the sea. We checked out the one going down towards the sea, but the sea reeds were too high for us to see much from the shore. 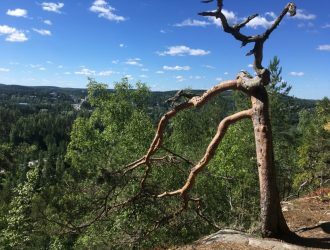 However, the hills around are covered with trees that are hard to find in Finland: oak, common alders, and sycamore maples. We spent quite a few minutes in the area just looking up, admiring the trees, and the multitude of birds preparing for their yearly migration. As we returned to the original path, a few minutes later we happened upon a magical place where two different forest types changed dominance: light into dark, leaves into needles, fairies into gnomes. I have a very vivid imagination so I could almost see the gnomes peering at us from behind the massive moss-covered erratic boulders or feel the brush of forest fairy wings on my face. Okay, it was spider web actually but that’s kinda the same thing, isn’t it? 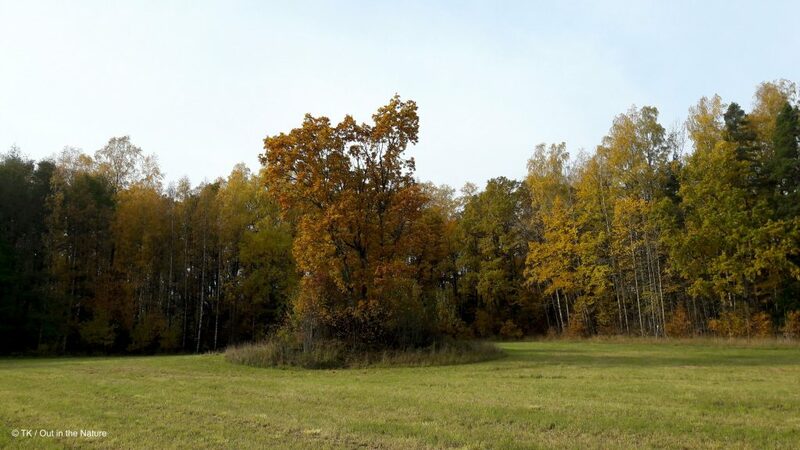 These type of leafy groves are rare in Finland due to the fact that it is so far up North. The area has been owned by the Stensböle manor house from as early as from the 14th century; one of its owners (according to the signposts earlier) called Wentzel Fredrik Rotkirch had helped the towns folk by introducting the potato into the area and distributing free potatoes for crops after he had learned of them during the Pomeranian war in the 1750s. 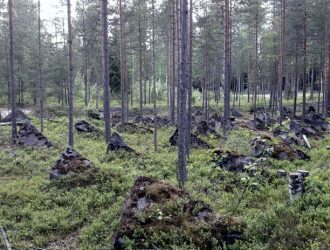 It doesn’t require a degree in botany to see how fertile the soil in the area is: the black, moist soil has protected this unique landscape for millennia in cold Finland. Fertile soil together with the adjoining sea, the area is a haven for various types of birds. 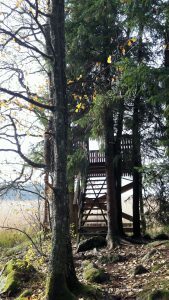 There is even a lovely birdtower suitable for gazing at the sea and all the birds on the path, marked with an arrow in Finnish stating lintutorni. 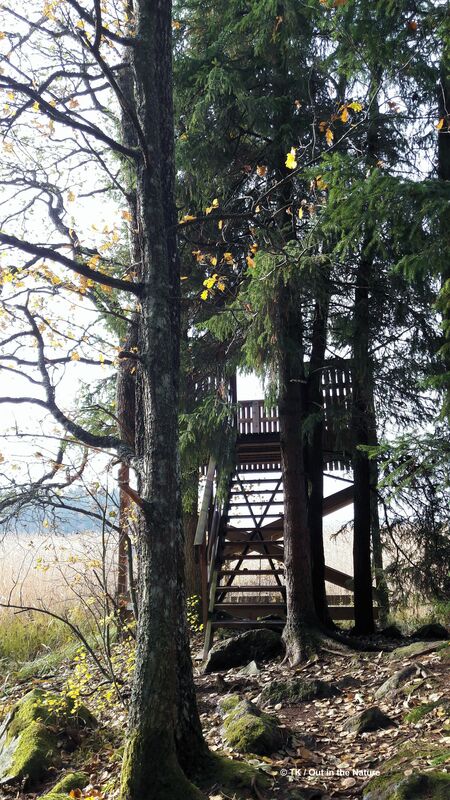 The birdtower is the oldest and highest in the Porvoo region, fitting 7-8 people at a time. The surrounding bay area widely covered with protective reeds is perfect for birds of all species, so it is easy to stay in the tower for a longer period of time. About half way of the trail, you suddenly see a plain sign on the side of the road stating iso tammi. 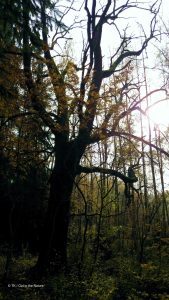 It literally means ‘big oak tree’ in Finnish, and it’s there so that you don’t miss one of the largest and oldest oak trees in the area. 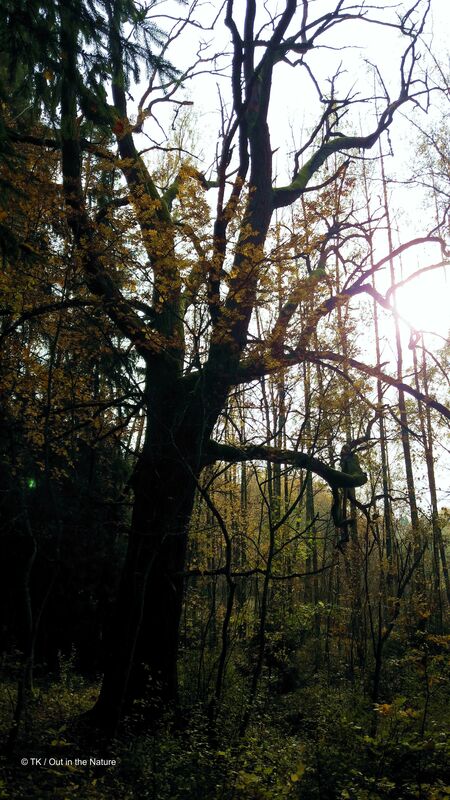 Even in the autumn, having lost some of its leaves, the oak reaches its heavy branches up into the sky, looking knowledgeable and mysterious. 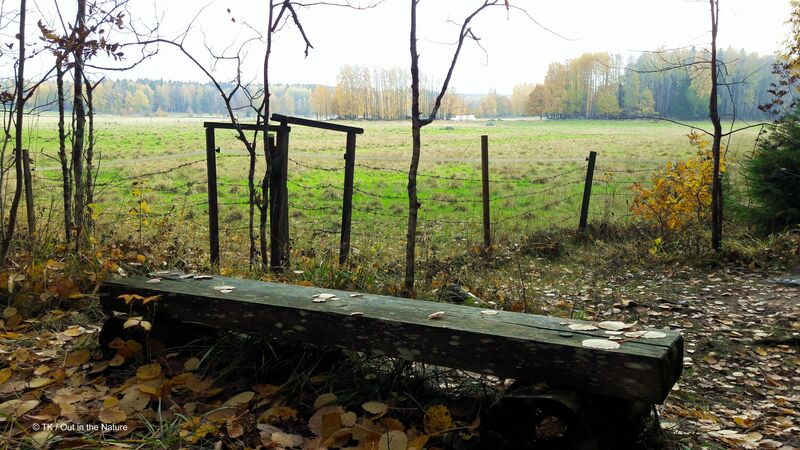 The path veers further to the left, reaching the side of the old Stensböle manor fields that are now separated from the path with an electric fence and barbed wire (= that means don’t go there). 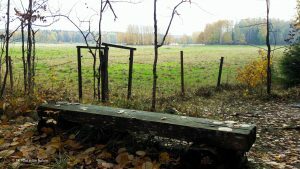 There is a lovely bench situated slightly above the field so you can take a seat, enjoy some snacks, and take in the pastoral views. The trail ends with more lush and dark-green pine forest, duckboards, and gnarly roots covering a long expanse of the path. 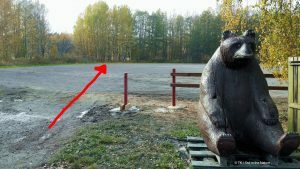 You will soon find yourself next to the same large information post, which then leads you back over the fields to the guardian bear next to the sports field. Address: Tarkkistentie 155, Porvoo. Next to this address is a car park where you can park your car for the duration of your visit. How to get there: You can get to Porvoo and Ekudden by car, by public transport or by bicycle. Car: Set Tarkkistentie 155, Porvoo, in your navigator. Just next to it is a small carpark where you can park your car. Bicycle: There are well-maintained gravel and asphalt roads for bicycles as well as excellent maps. The bicycle routes follow closely to the car route. However, unless you are a very experienced trail-biker, it makes sense to leave your bicycle at the carpark and just walk the nature trail. Public transport: Getting to Porvoo from, for example Helsinki, is very easy and there are buses going several times an hour. 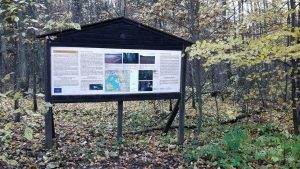 Check the timetable from the centre of Porvoo to Ekudden from here or walk the 3km distance in beautiful and serene scenery. 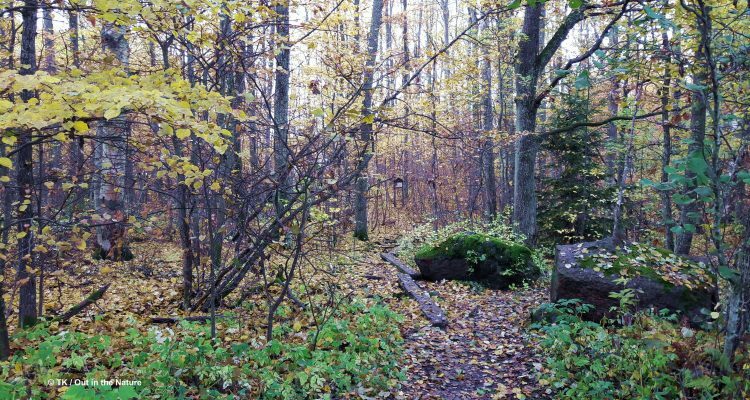 Accessibility: The Ekudden trail is not accessible for wheelchairs or children’s buggies because you have to cross duckboards, make your way over some fallen tree trunks, and walk on quite narrow bits of the path. The path is, however, suitable for children as long as you keep a good eye on them and inform them that there are holes in the path that may hurt them. There are some rises and falls on the path but in general it is an easy to moderate trail. When to go: You can visit the area at any time of the year. If you visit during snowy or wintery seasons, make sure you are careful because a lot of the more tricky areas can be hidden by snow. You don’t want to fall and injure yourself. Also note that there are no lights on the path, so make sure you have enough time before darkness descends to get out safely. What to wear: Mosquito repellent in the summer. Hiking shoes are almost always compulsory, but depending on the weather, make sure your shoes are waterproof or wear gum boots. 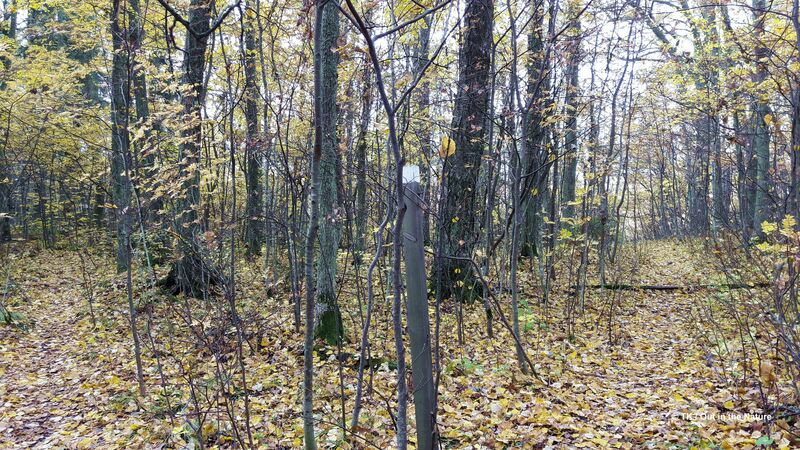 Special to remember: The Ekudden area is a nature reserve so you are not allowed to take or leave anything in the forest. Pick up any rubbish if you see any on the trail.